PS4 Pro and controller. Not pictured: The more-relevant-than-ever third device essential for console gaming. 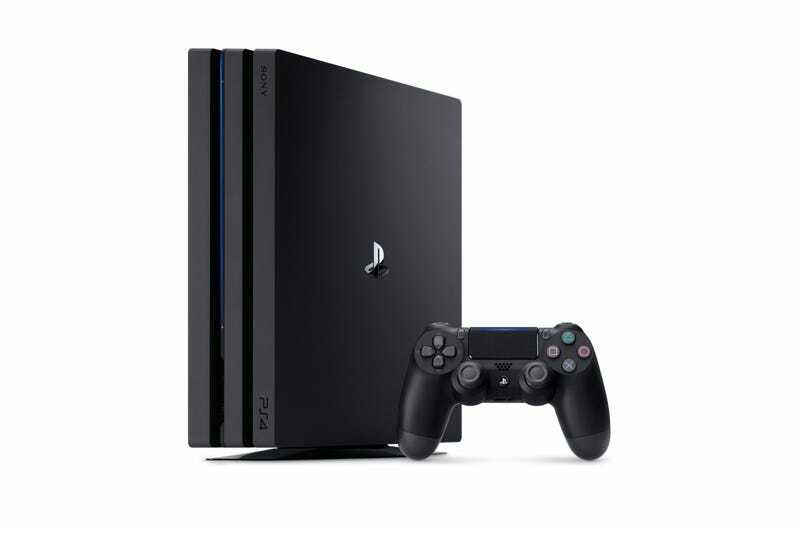 Sony’s new, more powerful $399 console, the PS4 Pro, has been designed to improve the graphics of new and old PS4 games. But conversations with developers at the PS4 Pro’s reveal event in New York City on Wednesday made it clear that it will also make console gaming more complex, introducing greater variation in a game’s graphics from one model of PS4 to the next and among a range of TVs. The Pro will sometimes even offer improved framerate performance for those with lesser TVs. These added options will excite some gamers and stress others. For better and worse, they will diminish the uniformity of experience that console gaming has tended to have in contrast to PC gaming. Much of this will happen because the November-launching PS4 Pro will detect the type of TV to which it is connected and output distinct visuals as a result. That will increase the relevance, as no console ever has before, of the kind of TV a console gamer owns. It will also make it harder for owners of the PS4 platform to assume they are seeing more or less the same visuals as their fellow PS4 gamers and reviewers. A PlayStation 4 Pro owner who has a 4K TV that supports high-dynamic range (HDR) visuals will see new Pro-supporting PS4 games display at 4K resolution and sport a wider range of colors that allows extremes of light and dark to better display at the same time. A Pro owner who merely has a current-standard 1080p TV may also see marginal improvements to games that are programmed to use the more powerful console’s power for non-4K/HDR effects. According to developers working on games for the Pro, these gamers may see the game they’re playing running at a more stable framerate or with some improved graphical details. Gamers who have a standard PS4 but a TV that supports HDR will be able to see some degree of HDR visuals in games that are patched or developed to support it. People who are playing new PS4 games on a standard PS4 with a standard 1080p TV will see graphics that are likely worst among these options, though it’s not clear how far a drop-off they’ll have in graphical quality. This option might not be too bad, because, as any PS4 owner can attest, PS4 games have looked pretty damn good as is. Like the Nintendo 3DS’ glasses-free 3D and any virtual reality technology before it, 4K and HDR video game graphics are tough to appreciate without seeing them in person. They can’t be seen in a livestream or on regular TVs, leaving those who have seen them to provide eye-witness testimony for everyone else to judge. Unfortunately, words tend to fail when discussing differentials in graphical quality. The games at Sony’s NYC PS4 Pro event looked great on PS4 Pro event, which, well, it helps if you see it for yourself. Some of the potential graphical differences were evident when Michiel van der Leeuw, the tech director at Guerrilla Games, and studio boss Herman Hulst, flicked a demo of next year’s attractive Horizon Zero Dawn from one type of visual output to another. Running a demo of the game on a $6,000 Sony 4K TV, they first toggled from 4K output to 1080p. Horizon is set in the wilderness, and as they went from 4K down to the resolution on most of our TVs, a patch of foliage in the background switched from clear and distinct to a fuzzy mush. “The difference [is] you being able to distinguish the individual leaves in the distance, where it becomes kind of a blurred texture otherwise,” Hulst said. That difference, once pointed out, was stark, though possibly not noticeable in a game that has looked ridiculously good when shown at gaming conventions on 1080p displays. “It still looks amazing, I think, on a regular 1080p,” Hulst added. If the difference in, say, the detail of foliage in a game that already looks great in 1080p seems marginal, it is. At the NYC event, developers of the game For Honor were talking about how the Pro would enhance things like the distinctiveness of pine needles in a tree and the quality of reflections on an axe. For some gamers, these are unimportant added sparkles. To others, they are the kind of visual improvements that previously made 1080p graphics preferable to 720p or that made seeing a GameBoy game in color preferable to playing it in black and white. Later in the Horizon demo, Van Der Leeuw paused as the in-game sun beamed through a thick cover of clouds. He switched the game’s HDR settings on and off. Here, the difference was far more pronounced. With HDR on, the sun’s rays splashed the clouds with a wide range of warm colors. Without HDR, the sky was still bright, but closer to a uniform gray. Like most game companies, Sony loathes to let people snap photos of their games off of a TV screen, but we asked and got the ok to show a comparison at reduced size. Even non-ideal iPhone snaps help show the difference. But, for everyone’s sake, don’t mistake these for direct feed, high-quality shots, because they clearly are not. On the left, that’s Horizon Zero Dawn running on a PS4 Pro on a 4K TV with HDR effects turned on. On the right, HDR is off, resulting in grayer skies. Both versions have the same level of graphical detail, same amount of cloud detail, but less going on with light and color in the non-HDR one. This should at least give you a relative sense of the different color range possible with HDR. The game looked great either way, but looked unmistakably better with HDR on. The Guerrilla developers covered some of the graphical variation that could occur between Pro owners who did or didn’t have 4K/HDR TVs, but there are other possible gamers to consider. There are people who will only own a standard PS4 but who might have a TV that can display HDR. Those gamers, Sony says, will see HDR-enhanced graphics via the 4.0 PS4 system update next week, though only for games that support or are patched to support the display HDR visuals. We haven’t seen this in action. This HDR promise from Sony for base PS4s has confused some onlookers who believe that true HDR visuals require a more advanced HDMI port than the one on the original PS4. A Sony spokesperson maintained, however, that connecting a PS4 with the forthcoming 4.0 firmware update to a TV that supports the HDR10 standard would “automatically enable HDR and Deep color setting” on the console. All of these options for prettier games are moot if gamers don’t buy the Pro or better 4K and HDR-ready TVs. Slow adoption of those devices could make all of this another failure of industry hype, like the push for 3D TVs and graphics a few years ago. Or it’ll be like the move from standard definition TVs to HD TVs, and sufficient millions will jump on board. The other thing that could should short circuit these changes would be game developer apathy. Most gamers won’t have a Pro console or an expensive new TV, so designing games to support these new graphics options only makes sense if doing so isn’t too laborious. It sounds like it won’t be. At the NYC event, Sony’s selection of developers made it sound like making sure games support HDR wouldn’t require a lot of additional work. Al Hastings, chief technology officer of frequent Sony developer Insomniac Studios estimated that it was only taking one “person-month” (the amount of labor it’d take one person to do in one month or, say, two people to do in half a month) to get the PS4's Ratchet & Clank game to support HDR. Naughty Dog’s Christian Gyrling said it took roughly twice that for his studio to prep the PS4's The Last of Us and Uncharted 4 to also support HDR. The games will get small patches of 100MB or so to enable that functionality, mostly using existing assets from the games. Both men said that new games built from the ground up to support the Pro and the base PS4 might require a little more work, but not an extensive amount. Sony’s selection of developers made it sound like making sure games support HDR wouldn’t require a lot of additional work. HDR visuals were clearly the favorite topic of the developers talking up the Pro for Sony. None of the developers at Sony’s event spoke much about framerate boosts. The Guerrilla guys were only talking about a more stable framerate for Pro owners who play on 1080p sets, emphasizing that they are targeting 30fps for all Horizon players but that they want to focus on giving 4K/HDR TV owners better quality images. Hastings and Gyrling observed that a developer could double their framerate for a game running on the Pro if the game’s framerate was entirely dependent on GPU performance, since that is doubled for the new console, but they said that the framerate in many PS4 games would be constrained by other factors that the Pro couldn’t help with. There was talk of the Pro supporting more stable framerates, but short of a mention that it might be used to make some VR games run at higher FPS (something that would reduce the risk of motion sickness), beefed up framerates don’t seem to be a PS4 Pro talking point. Instead, there was a lot more talk about 4K and, especially, HDR. Microsoft’s recently released Xbox One S also outputs HDR graphics on TVs that support the tech, and the company is positioning its 2017 Xbox One iteration Scorpio as a far more powerful console than even the PS4 Pro. That at least sets this fall to be a focused test for the appeal of HDR graphics on the base PS4, the Pro and the Xbox One S. A caveat: Hastings and Yerling both expressed concern about a lack of standardization among HDR TV sets, even those that use the HDR10 standard. And that, you guessed it, may result in yet another set of variations in the quality of how games look from one TV to another. “I think this will open the floodgates and force the manufacturers [to] get all lined up,” Hastings said. For gamers (or this author) who might be feeling uncertain that they own the right TV and might be unsure which new TV, if any, to get, there’s at least the solace that games are likely going to continue to look really good on 1080p sets. The Pro may even make them look better. Early adopters will grab the Pro and report back about which TVs a game looks best on. Then the rest of us console owners will have to decide something we haven’t had to decide in some time: do we care about getting a new TV, and, if so, which one? Or is the old set going to be good enough?